Maeve McCarthy’s paintings in Back to the Garden are not entirely given over to the garden, though it features large, in a haunted, misty, mysterious way: masses of lush hydrangea blossoms looming out of the damp foggy night, trees against the sky, massed borders of perennials in shade. The first painting in the exhibition is called Abandoned Village, a cluster of low buildings in the distance, again by night – night and twilight are the abiding times throughout all of the work. It’s interesting that the largest pieces in the show, by far, are the close-up, compressed views of blossom in the containment of the garden, while more expansive views, even those evoking immense spaces, are small in scale. The effect is akin to long shot and close-up, cinematically (McCarthy worked in film animation for a while, and she has made at least one video closely related to her painting), with the close-ups drawing us, even compelling us, into inner, psychological spaces. The accompanying gallery note puts the work in context, sketching a background story that is something like this: McCarthy is saying goodbye to Brandon, Co Kerry, where she lived for a time. Perhaps it is the abandoned village mentioned. Both her parents died during this period. She returned for a while to her family home, in Glenageary, Co Dublin – a common enough experience, and one with all the strangeness of revisiting a familiar world that has lost its familiar people. She will be moving on from Glenageary in the not-too-distant future. All of this experience, reflection and anticipation is distilled in the paintings, which are very quiet and still. They express both a state of being detached, at one remove, even a restlessness, but also a profound emotional resonance, and perhaps a desire for home and belonging; varieties of prospect and refuge, in a way. ​The houses we see, handsome terrace dwellings, illuminated in the darkness by the glow of electric light, are inviting, but they also appear vacant, undercutting their welcome, and perfectly embodying the ambivalent, paradoxical inclination to maybe settle – or just to move on. Pictorially, McCarthy’s viewpoint, and hence ours, is that of an outside observer. Well known as a portrait painter, here she opts not to depict people, but her paintings are clearly about people, about life, and we can easily relate to them via our own experiences. A technically accomplished artist, she favours technique that does not advertise itself, and in this body of work it certainly doesn’t. She sets herself many challenges and more than meets them, all without being showy. But take a moment to consider how well these paintings are made and you will appreciate the exceptional level of her achievement. This familiarity can be comforting, even oddly reassuring, when the exhibition is good overall. The RHA annual represents a sum total sample effort by a particular cohort of artists, some established or establishment (including RHA members, who are entitled to exhibit), some invited (en route, presumably, to establishment status), and some accepted through open submission, which this year attracted 2,476 entries from 1,400 artists, from which 321 artworks got in. In such circumstances, what anyone who sees a lot of art on a regular basis is looking for is quite simple: the odd work that stops you in your tracks, standout pieces, surprises. This year that accolade goes to RHA member Maeve McCarthy, who shows just one painting. In the Garden is a masterful, tall, dark composition in which a mop-head hydrangea lurks in the gloom at night. It’s a brilliantly gothic garden scene in murky green, mouldy white, pale verdure and black. Bravo. McCarthy has found her painterly mojo again after several years of her annual show contributions being competent but ignorable. Hydrangeas tend to produce a love/hate reaction in Irish people. This Japanese native shrub has long been a low-maintenance favourite for reliably blowsy blooming at Irish farmhouses and cottages. Overtly fancy but practically common, hydrangeas attract near contempt for their ordinary showiness and resilience. They have a novel, possibly once regarded as almost racy, ability to change colour in soils of different pH value, although white varieties do not. In the Garden is part of a body of work connected to McCarthy’s return visits to her grandmother’s home in rural Northern Ireland. 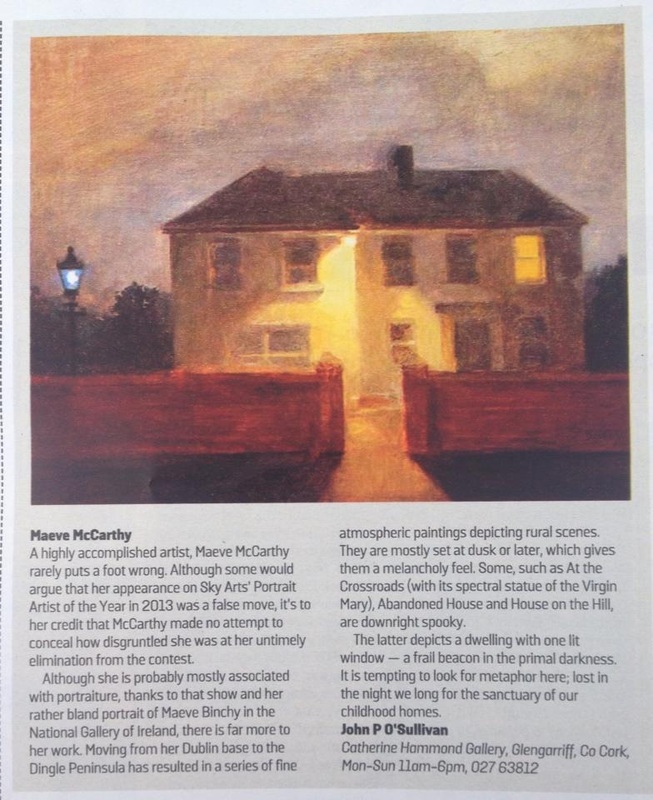 Although Maeve McCarthy is best known for her small-scale paintings, including immensely atmospheric studies of rural locations by night, she turns to drawing for The Return. The return is her own, from a Kerry village – the setting for most of her recent work – to Dublin and to tending her late mother’s garden in Glenageary. She also revisited the farmhouse near Newry where her grandmother grew up before moving south in the 1920s. The family spent time there every summer. McCarthy, who has worked in film animation in Ireland and Germany, travelled north with her brother Peter, a film-maker. The house, long abandoned but still standing, is the setting for the short, meditative film that gives the show its title. Sounds and images gently hint at recollections of lives lived there, losses and departures and the finality of time. Six large charcoal drawings feature the two family settings, north and south, by night. A mass of hydrangea blossoms glows luminously in the moonlight. In the soft, intricate layering of muted tones, McCarthy creates calm, accommodating spaces that allow for memories and reflection. Many of the works that linger in the mind are not the inevitable big showstoppers, of which there are several, but smaller, more muted pieces that catch the corner of your eye and draw you in. .................................... So too does Maeve McCarthy’s superb sequence of six nighttime views of rural habitation framed by the vast expanses of enfolding landscape and the deep sky. They’re beautifully observed and perfectly judged. Maeve McCarthy shows a suite of beautifully elegiac tempera paintings, which take their mood and subject from the title of one of them, Leaving the Village. All feature parts of a small town by night, in the subdued glow of electric light, and there’s an uncanny quietness and a sad, wistful atmosphere to works such as Rural Garda Station (right). All this stems from McCarthy’s close observation and meticulous realism, hallmarks of her work from the first. She has consistently made portraits, still lifes and landscapes. The latter have tended towards urban or semiurban settings, with a strong feeling of domesticity and habitation, and attentiveness to a sense of place. Although the interior and external spaces are unoccupied, the absent inhabitants are strongly evoked. Suggestions of memory, leaving and longing are usually implicit, as when we recall in great, if selective, detail a place in which we’ve lived or from which we are temporarily removed. In feeling, some of McCarthy’s paintings can recall Eithne Jordan’s understated studies of the urban and rural landscape, in which nothing is exaggerated or contrived. MAEVE MCCARTHY’S Molesworth Gallery exhibition Home stems from a year spent living in a rented house in a west Kerry townland at the foot of mount Brandon. The two-storey farmhouse reminded her of her grandmother’s ancestral home in Co Down, and set her thinking about the links and overlaps between house and home. That is the basic idea underlying her work. In other words, she didn’t opt to hunt out the picturesque in the natural landscape, as one might expect of a painter visiting Kerry, but concentrated on the homesteads people have made within the landscape. We don’t see people, and we don’t get to see inside the houses, but the pictures are all about habitation. There is a tremendous sense that the various buildings we see, including the one McCarthy lived in, are preserved with great effort from the depredations of time and the elements. They are islands of comfort, order and clarity. Sometimes, especially in the more formally composed images, they are quite like sculptures, poised geometric abstractions. It’s tempting to see these depictions of usually isolated houses, with a strong sense of inner and outer life, personal and public, as symbolic of the individual psyche, and indeed McCarthy acknowledges that in her note detailing the genesis of the show. She is a skilled naturalistic painter, and also a fine portraitist. Her forte is quiet, understated but meticulous observation, delivered with increasingly impressive technique. She simply doesn’t do stylistic flourishes, but give the work time and you will find it absorbing and beautifully made.